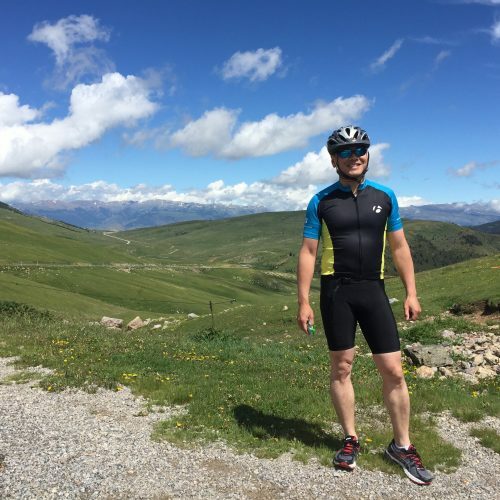 I am attempting to bike up one of the peaks in the Spanish Pyrenees. Things aren’t going well. I’ve been biking for a few hours, straight uphill. The grade is getting steeper. I have hours to go. I’m feeling tense and frustrated. I’m wondering if I will make it. So, I do the only thing that I think I can do. In the morning, the Backroads leaders gave us all a “route rap.” They showed us where the cycling routes were going to be for the day. They offered three options, which varied by length and altitude climb: short, medium, or long. The leaders were encouraging but blunt. The long option is doable but very challenging. A very long ride with a significant altitude change. We start at the bottom of the mountain and go to the summit. I decided to go for the long option. There aren’t many of us who did. But, I wanted to do each day’s long option. 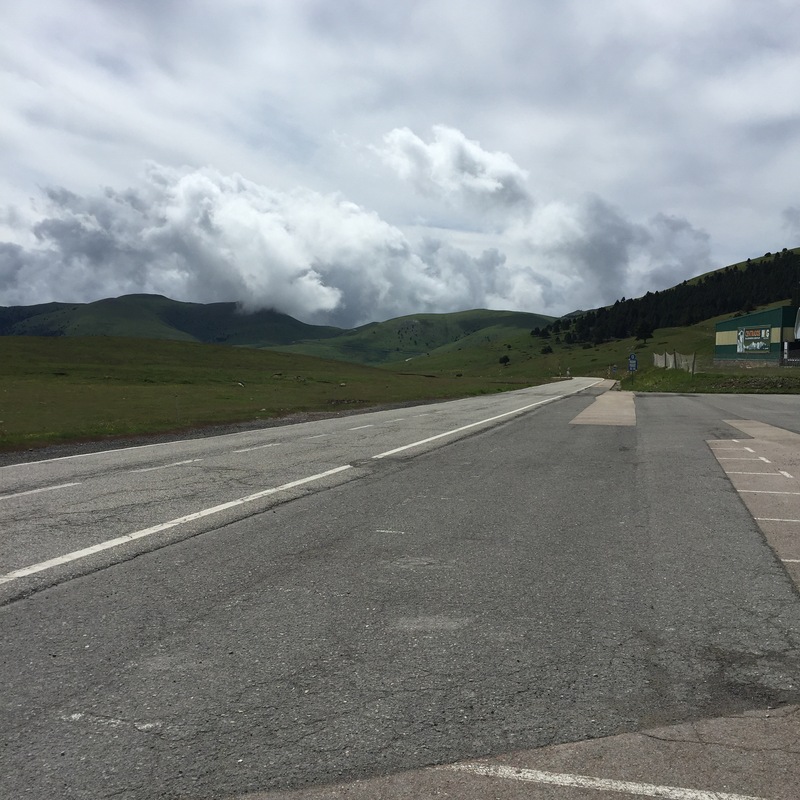 My thinking is that I didn’t know if I would ever be back in the Spanish Pyrenees to cycle. And, if I did, would I be able to do the challenging courses later in life? We filled our water bottles and packed snacks. The air was cold. Everyone layered up and jumped on their bicycles. We pushed off. My pace was slow. Our youngest child was on a bike attachment, which was linked to mine. So, I’m pulling for two. All the other riders zipped by. The route started flat, but began to climb. At the first check-in point, most of the younger riders stopped and jumped into the Backroads van for a ride to the summit. Our child felt cold and asked to get off, too. I removed her bike attachment. So, I then began to ride solo. I felt my pace was faster, but, then, I had a flat tire. So, I fell further behind. Once the tire was swapped out, I jumped back on. And, the road continued to get steeper. So, I breathe. I take 10 deep breaths. I feel better. My heart rate goes down, my legs feel more fresh. My mind starts to wander. I start to think about a particular work issue. I start to wonder how I will feel if I give up. I can feel myself tense up. The pain in my back gets sharper and sharper. It comes from being hunched over and holding bicycle handles for hours. My wrists and fingers are numb. The pressure on my lower extremities from the bike seat grows. It’s called perineum pain, and it affects men. I feel that I have a very painful toothache emanating from near my private parts. It is a very deep and throbbing pain. I am gritting my teeth now. I am praying that I don’t get a back spasm. I wonder why a person who last biked two years ago is doing the long option. I start to criticize myself. Most of the riders didn’t pick the long option, and here I am, a middle-aged guy, doing too much. My Imposter Syndrome has kicked in. So, I breathe more. But, it isn’t working as well. I’m still feeling a lot of discomfort and the road is getting even steeper. There’s another check-in point on the side of the road. Most of the other riders are there. They’re all jumping in the van for a ride up. I decide to keep going, alone. I don’t know why. There was no shame in stopping. It would be fun to ride in the van with the others. But, I wanted to try and get to the summit on my own. I for a period of time was very intrigued by the training that Navy SEALs do. Only 15% or so of candidates graduate from the grueling training program. The books talked about how making it through was a mental game. You have to be strong and fit, etc., but the soldiers who graduated were the mentally toughest ones. My back continues to tighten. The sun is out now in full force. I’m high up in altitude, and the heat is going up. The bottom half of my body feels like it’s going to explode. So, I pull off the road to drink some water. I get back on the bike. I remember the books and conversations about the special forces. I tell myself that this is a mental game, that my biggest obstacle is myself. I start to talk to myself inside my head: “Just choose not to feel the pain.” So, that’s what I do. The pain doesn’t exist. I don’t feel it. Amazingly, the pain ebbs. So, I keep pedaling. I remember a meditation workshop that I attended some years ago. It focused on observing life without judging it. The instructors asked us to do some relaxation breathing and focus on just being vs. allowing our minds to wander, worry, and ruminate. I look up. The windy road looks endless. I look at my GPS device. I realize that I have a ton of distance left to go. I feel pretty down. So, I decided to ignore my GPS device and the road. I decided to look down at my front tire and just focus on that. One pedal rotation at a time. I breathe more. I lower my heart rate and try to avoid going into an anaerobic state. The air is thin up here, but I keep inhaling. Pedal, breathe, pedal, breathe. A steady cadence. More time passes. As I bike further up, there’s almost no car traffic. So, I’m largely alone, but for the steady sounds of bird chirps and my bike tires on the road. Every small sound seems to be magnified. Gradually, the trees get smaller. I realize I’m almost above the tree line. The landscape begins to change, with more open fields. I turn a bend, and a cold and strong wind hits me. I’m in a desolate place. I feel my energy dip. This headwind is going to be tough. I think of my friend Chris Durbin, who ran the Boston Marathon in memory of his mother. I then think of my mother. Suddenly, from deep within, I begin sobbing. It’s over in 10 seconds. “Where did that come from?” I thought. But, I don’t want to think. I just need to keep going. I turn off my mind. I pedal and try to keep my front tire on the white painted line that marks the edge of the road. I keep my head down. Thankfully, the landscape flattens a little bit. I get to the top of what is a chair lift for a ski resort. But, I still have a ways to go. From far away, I see a Backroads van parked on the side of the road, at the summit. So close, yet so far. I try not to look at it. It’s a small white speck in the distance. I stare at my tire and pedal. I erase the thoughts in my head. I just watch the tire move. And, I get there. Eventually, with little fanfare, with no emotion, I reach the top. The wind is strong. I then feel relieved, happy, and utterly emptied. I smile. “I know,” I said. This was a fun trip. Over five-equivalent days, I biked about 240 miles, some of it on very steep inclines. It was both very challenging and very rewarding. Our Backroads leaders were great, the food and wine were delicious, and we met some other families who share our interests in travel and fitness. A family bike trip is filled with many good and vivid memories: sights, smells, and sounds. I feel very grateful! 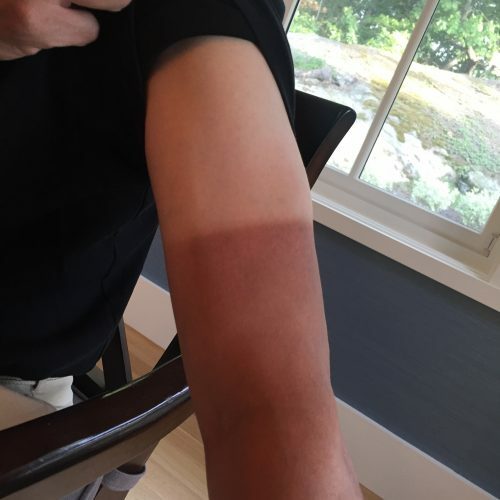 And, I got great tan lines on my arms. Sounds like a very cool trip.